We have always known that astronauts have to train for years to acquire superhuman strength and condition their bodies to withstand stresses that would kill mere mortals. 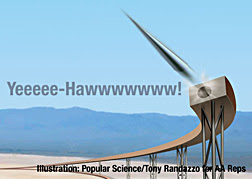 From Popular Science Magazine: Forget rockets. All you need to launch a satellite is a sled and a giant magnetic slingshot. Astronauts are trained to withstand as much as nine times the force of gravity. (Three Gs, by comparison, could make the average guy pass out.) But even the toughest among them fall out of the running when it comes to a launch concept from a company in Goleta, California. To survive the ride on Launchpoint Technologies’s invention, the payload has to be able to survive a brain-splattering 10,000 Gs. Tourist's Guide to Space: Can't decide where to spend your fortune on a trip out of Earth's atmosphere? Click here to check out Popular Science's Tourist's Guide to Space. Read all about the Rocketplane: With its rocket-engine tail and fuel-packed fuselage, this modified business jet might be the first private craft to launch tourists into space. Click here to read the article. Junkyard on the Moon: Man's exploration of the moon has left behind over 20 tons of probes, rovers, rocket boosters and assorted other detritus scattered around the whole of the lunar surface. The moon has no atmosphere to burn up incoming objects, so once a spacecraft's orbit decays, it will eventually end up in a pile somewhere on the surface. Read the PopSci article here. The Top-Secret Warplanes of Area 51: Stealth jets? Hypersonic bombers? What's really being developed at the military's most famous classified base? Click here for Popular Science's in-depth reporting on the topic.